NICE TRY, but it's clear you've been spending too much time shopping in Freeport. 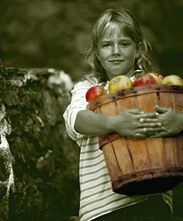 Who wouldn't want to buy an apple from this comely lass? Well, certainly not a true Clark's Coveian, who would have spotted the ugly brown discoloration on that Golden Delicious immediately. Like we said, we're fussy about our apples...all twenty seven varieties of them. OK, so you got a little confused. You bleed applesauce.